The battle in Iraq consists of "Turkish-backed Sunni jihadis rebelling against an Iranian-backed Shi'ite-oriented central government," I wrote in a recent article. Some readers question that the Republic of Turkey has supported the "Islamic State in Iraq and Syria," the main Sunni group fighting in Iraq. They point to ISIS attacks on Turkish interests, within Turkey, along its border with Syria, and in Mosul and a successful recent meeting of the Turkish and Iranian presidents. Good points, but they can be explained. First, ISIS is willing to accept Turkish support even while seeing the Islamist prime minister and his countrymen as kafirs (infidels) who need to be shown true Islam. Recent years have often seen official language from the two countries about prospering bilateral trade and common anti-Israeli ideological solidarity. But mostly out of sight have been indications of rivalry, distrust, and mutual sectarian suspicion between the two Muslim countries. Ankara may deny helping ISIS, but the evidence for this is overwhelming. "As we have the longest border with Syria," writes Orhan Kemal Cengiz, a Turkish newspaper columnist, "Turkey's support was vital for the jihadists in getting in and out of the country." Indeed, the ISIS strongholds not coincidentally cluster close to Turkey's frontiers. 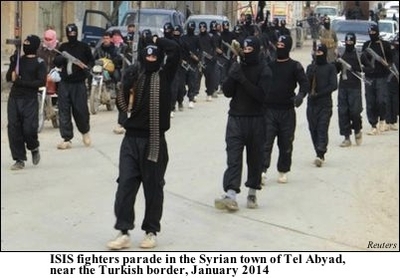 Kurds, academic experts and the Syrian opposition agree that Syrians, Turks (estimated to number 3,000), and foreign fighters (especially Saudis but also a fair number of Westerners) have crossed the Turkish-Syrian border at will, often to join ISIS. What Turkish journalist Kadri Gursel calls a "two-way jihadist highway," has no bothersome border checks and sometimes involves the active assistance of Turkish intelligence services. CNN even broadcast a video on "The secret jihadi smuggling route through Turkey." Actually, the Turks offered far more than an easy border crossing: they provided the bulk of ISIS' funds, logistics, training and arms. Turkish residents near the Syrian border tell of Turkish ambulances going to Kurdish-ISIS battle zones and then evacuating ISIS casualties to Turkish hospitals. 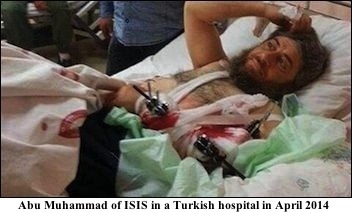 Indeed, a sensational photograph has surfaced showing ISIS commander Abu Muhammad in a hospital bed receiving treatment for battle wounds in Hatay State Hospital in April 2014. One Turkish opposition politician estimates that Turkey has paid $800 million to ISIS for oil shipments. Another politician released information about active duty Turkish soldiers training ISIS members. Critics note that Turkish Prime Minister Recep Tayyip Erdoğan, has met three times with someone, Yasin al-Qadi, who has close ties to ISIS and has funded it. Why the Turkish support for wild-eyed extremists? Because Ankara wants to eliminate two Syrian polities, the Assad regime in Damascus and Rojava (the emerging Kurdish state) in the northeast. Regarding the Assad regime: "Thinking that jihadists would ensure a quick fall for the Assad regime in Syria, Turkey, no matter how vehemently officials deny it, supported the jihadists," writes Cengiz, "at first along with Western and some Arab countries and later in spite of their warnings." Regarding Rojava: Rojava's leadership being aligned with the PKK, the (formerly) terrorist Kurdish group based in Turkey, the authoritative Turkish journalist Amberin Zaman has little doubt "that until recently, Turkey was allowing jihadist fighters to move unhindered across its borders" to fight the Kurds. More broadly, as the Turkish analyst Mustafa Akyol notes, Ankara thought "anybody who fought al-Assad was a good guy and also harbored an "ideological uneasiness with accepting that Islamists can do terrible things." This has led, he acknowledges, to "some blindness" toward violent jihadists. Indeed, ISIS is so popular in Turkey that others publicly copy its logo. In the face of this support, the online newspaper Al-Monitor calls on Turkey to close its border to ISIS while Rojava threatened Ankara with "dire consequences" unless Turkish aid ceases. In conclusion, Turkish leaders are finding Syria a double quagmire, what with Assad still in power and the Kurdish entity growing stronger. In reaction, they have cooperated with even the most extreme, retrograde and vicious elements, such as ISIS. But this support opened a second front in Iraq which, in turn, brings the clash of the Middle East's two titans, Turkey and Iran, closer to realization.